Tonight I replaced my 2+ year old LG vx6000 with a LG CU500 [Amazon]. Family plan upgrade time. I haven’t had too much time to play with it. Perhaps later I’ll take a few test photo’s outside in daylight (if it’s not raining) and see how they look, and perhaps upload them. I first setup bluetooth between my Mac and my phone, just paired them up. Took about 10 seconds. Then tried to do the same with my Thinkpad. Took about 2 minutes, thanks to slightly more confusing software (never did either). Next task was to transfer a picture from the phone to the PC. After about 20 minutes I had no success on my Thinkpad, kept being told “Sending Cancelled” by the phone. Went over to the Mac, and it took no more than 15 seconds. Everything is easier on a Mac. Call quality seems very clear. Good indoor reception. Seems like stronger vibrate mode than the vx6000, or maybe mine just got tired after so long. 1.3 MP camera is surprisingly good… will need to purchase a memory card (MicroSD) tomorrow. Recording video’s is super awesome… again, will need that memory card. Bluetooth on Mac: sweet. Bluetooth on Thinkpad: ugh (see above). Mp3 player looks pretty solid, again need memory card, though this is a feature I’m not really that interested in. Menu’s very well laid out, organized, clear. Build quality seems exceptionally good. I’ve held a couple of them now, and all are rock solid. Comes with travel charger, rather than one with a stand… prefer the stand on my desk, no option to buy that. Hooking up the cable is more cumbersome than slipping it on the stand. Apparently supports 3GPP, so a movie could be saved to the memory card… note: buy memory card. Buttons on the side are pretty slim and take some getting used to… not good for gorilla’s who use cell phones. Bright vibrant screen, great looking case, again, great build quality. Photo’s have EXIF data! Unlike the vx6000, which was a drag. 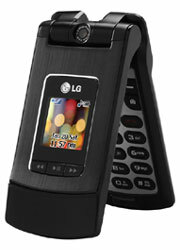 seems to be the phone with latest features..@ 69.99 from cingular premier..its a slickdeal. How did you get pix from cellphone to Mac? Mine connects fine and my Mac finds the jpgs on phone, starts to transfer data and then connection quits. I use Kensington USB Bluetooth adaper. Have no problem sending photo from Mac TO phone, but cannot get photos FROM phone to Mac. i got mine about a week ago, and is it werid that i can’t find a way to get my music to be able to play in the music player? i can’t get the stuff on the memory card to play with the cover down or accsed by the bottons in the front. any suggestions?